Wallace Michael Shawn (b. 12 November 1943) is an American actor, voice actor, playwright and essayist. He is best known as the voice of Rex in the Toy Story series, Calico in Cats & Dogs: The Revenge of Kitty Galore, Vizzini in The Princess Bride, and voice of Taotie in Kung Fu Panda: Legends of Awesomeness. Shawn is from New York City. Shawn was born in New York City, to a Jewish family. His parents are William Shawn (1907–1992), the long-time editor of The New Yorker, and journalist Cecille Shawn (née Lyon; 1906–2005); his brother, Allen, is a composer. 1982–83 Taxi Arnie Ross Episode: "Love Un-American Style"
2005 Stargate SG-1 Arlos Episode: "The Ties That Bind"
↑ Steindler, Catherine (Spring 2013). "Interviews, Deborah Eisenberg, The Art of Fiction No. 218". The Paris Review. ↑ 2.0 2.1 "Wallace Shawn Biography". TV Guide. Retrieved 2 February 2013. ↑ "Bag of Tricks". Tablet Magazine. 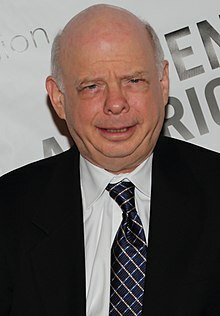 ↑ "JUF : Tweens : Celebrities : Wallace Shawn". ↑ "Councils, Staff and Board of Jewish Voice for Peace". Jewish Voice for Peace. ↑ see pg. 20 of liner notes accompanying "Allen Shawn – Piano Works" CD issued by Coviello Classics label (COV 91414)> "Allen Shawn - Klavierwerke". Music Reference. Retrieved February 3, 2017. Higgins, J. (2012). "The End of Room-Space: Domesticity and the Absent Audience in Wallace Shawn's the Fever". Journal of Dramatic Theory and Criticism 26 (2): 57–74. Hilton Als (Summer 2012). "Wallace Shawn, The Art of Theater No. 17". The Paris Review. http://www.theparisreview.org/interviews/6154/the-art-of-theater-no-17-wallace-shawn. This page was last changed on 10 December 2018, at 14:29.